This page is for you or someone you know, who may be a homeowner in Frederick Maryland facing a financial crisis and possible foreclosure due to a financial hardship. I'm creating this page to give you a place to go to, to get the information you need about Short Sales. Keep in mind, I can't go over everything you need to know on this website nor will this pertain to your exact situation, but hopefully you can start to feel like there is hope. Please note-this is the largest investment of your lifetime and the impact could last forever! Before you damage your credit and allow your home to go to foreclosure, you need to know what your options are. Don't wait until it's to late! This is certainly a time when every day you put off dealing with this situation, the situation could get worse. New HAFA Program! Watch this video! Are you about to lose your home or know you are getting ready to fall behind on your payments? There is help for you. One of the most stressful times in life is when the joy of home ownership turns into a burden. Let me say this again: IT'S NOT YOUR FAULT! That's the first thing you have to come to realize. So many variables have played into the current housing market. Most, if not all, were and are out of YOUR control. As I tell my distressed sellers, you are not alone. Look in the grocery store, at work, your kids school, your friends . . . they're going through the same exact crisis, you just don't know it. What are your options: There are several options for you. 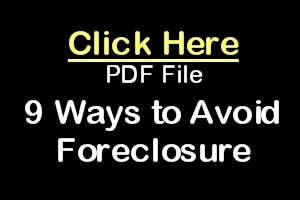 Please print the form '9 Ways to Avoid Foreclosure' located below. Keep this form in front of you when discussing your options with your lender. 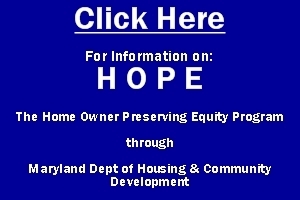 First the Maryland Department of housing has created a site for Maryland Homeowners. They provide a network of counselors and various programs to help you refinance and catch up on payments. This is a great place to start. Open the conversation with your current mortgage holder to see if a loan modification is available as well as a lender who is familiar with the HOPE program. You want to see if you'll be able to refinance through the Fannie/Freddie Mac program that will bring your payments down. If you find out that refinancing/loan modification is not an option another option that might be available to you is a 'Short Sale'. No matter where you live in the country, even Frederick Maryland you have probably heard of a ‘Short Sale’. A short sale is when a homeowner owes more to the lender than the market value of a property. For example let’s say you owe $320,000 and your home is now only worth $250,000. So in order to sell the owner has to go to the lender and ask the lender if they will accept less than what they owe. The lender is not in the 'Home Selling Business'. They don't want your house. It's very costly for a lender to foreclose on a home. To do a short sale you will need a lot of patience. Every lender has different guidelines and rules. Some lenders will ‘pre approve’ a short sale but most lenders won’t even consider it until you have a contract on your home with a buyer to purchase. Also, the process timing can vary. It can take anywhere from a few weeks to several months for a short sale to be approved by the lender. So be patient. If you qualify it can work, it takes time and diligence. Also, keep in mind, if there’s more than 1 lender (like a home equity line, 2nd mortgage or 3rd mortgage) each lender will need to approve the short sale. Each of these lenders have different processes and will take more time to give approval. I've heard people say they're just going to let their home go to foreclosure. Don't do this if you can help it. People don't realize it, but just about everything you do is tied to your credit. Your car insurance, credit cards (they will actually increase your interest-regardless that you've been paying on time to astronomical amounts), cable, phone, cell phone, electric, Employment (even your current employment), security clearances and so much more.